The Noakes Foundation has put out a new book entitled Diabetes Unpacked* , edited by Dr. Zoe Harcombe PhD. It is a compilation of chapters written by a who's who of the low carborati. This installment deals with Chapter 3 by Dr. Jason Fung, a nephrologist masquerading as an obesity specialist and diabetologist. He has no formal training in either, and his grasp of some pretty basic physiology is tenuous at best. That latter "charge" can be backed up by fact checking (or attempting to fact check that which isn't simply Fung POOP (Pulled Out Of Posterior)) any of his various blog articles, books, podcasts or YouTube videos. I first heard of Dr. Fung sometime several years ago when I was linked to the following video: Insulin Toxicity and How to Cure Type 2 Diabetes. The title pretty much says it all regarding Dr. Fung's view. Insulin toxicity? Around the 2:30 mark Fung says that the cause of IR is often thought to be obesity, but it's difficult to come up with any sort of mechanism. Hello????? While there are a few avenues of academic scientific thought on this, over the years I think I've presented enough evidences for a "sick fat" mechanism that leads to ectopic fat deposition and beta-cell dysfunction. This mechanism is consistent with pretty much any nuance thrown at it, e.g. lipodystrophies and so-called MOTPs (metabolically obese thin people). When new antibiotics are introduced, they are extremely effective, but this honeymoon period does not last long. With time and steady use, the antibiotic loses effectiveness, as some bacteria become drug-resistant “superbugs”. This situation is not limited to only a few antibiotics, but is a universal problem because it reflects the universal principle of homeostasis. Exposure creates resistance. Increased antibiotic use naturally selects resistant organisms, which eventually dominate, rendering the antibiotic useless. Our knee-jerk reaction as doctors is to prescribe even more antibiotics to “overcome” the resistance – which backfires, since it only leads to more resistance. Overcoming resistance requires using fewer antibiotics, not more. Persistent, high-level antibiotic use causes antibiotic resistance. I'll be forever grateful to the expert in bacteriology who was able to treat my own mother's staph infection contracted in 2011 with her first knee replacement. According to Fung, my mother's antibiotics should have been reduced? SERIOUSLY??? Thankfully her case was treated with intensive antibiotics (6+ weeks of daily IV infusions) and she's still with us today. Seriously Jason Fung, shut the fu** up about things you obviously don't understand. More importantly, we see that Fung is now doubling down on his inaccurate information. Rather than re-think his analogies, he's repeating them in greater detail. I am going to address just one more issue for today. 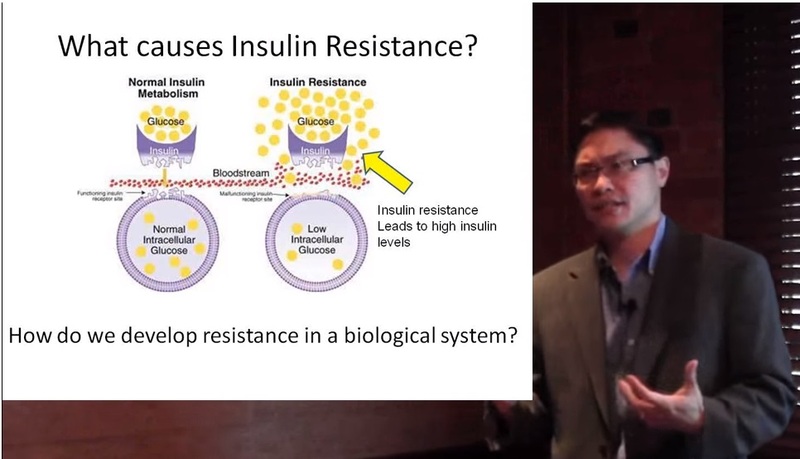 Does Insulin CAUSE Insulin Resistance? Surgical removal of the insulinoma dramatically lowers the patient’s insulin levels. With the tumor gone, insulin resistance is also dramatically reversed, as well as associated conditions such as acanthosis nigricans. 3 Reversing the high insulin levels (the causal factor) also reverses insulin resistance. Experimentally, the constant infusion of insulin into a group of normal, healthy, non-diabetic volunteers can easily induce insulin resistance. 4, 5 Within days, insulin sensitivity drops by 20 to 40 percent. The implications are simply staggering. Healthy, young, lean men can be made insulin resistant simply by administering insulin – which causes insulin resistance. High doses of insulin used in T2DM can also induce insulin resistance. 6 In one study patients were started on intensive insulin treatment in order to tightly control blood glucose. In six months, their average insulin dosage increased from zero to 100 units a day. Blood glucose control was indeed very good. But the more insulin they took, the more insulin resistance they got – a direct causal relationship, as inseparable as a shadow is from a body. Even as the blood glucose was improving, the T2DM was getting worse. OK. Here is reference 6: Henry RR et al. Intensive Conventional Insulin Therapy for Type II Diabetes. Diabetes Care. 1993 Jan; 16( 1): 23– 31. "In six months, their average insulin dosage increased from zero to 100 units a day." "The total dose of exogenous insulin required was 86 ± 13 U at 1 mo and 100 ± 24 U at 6 mo." "Blood glucose control was indeed very good. But the more insulin they took, the more insulin resistance they got – a direct causal relationship, as inseparable as a shadow is from a body." "After treatment, basal HGO [hepatic glucose output] fell 44% from 628 ± 44 to 350 ±17 𝝁mol.m-2.min-1 (P < 0.001), and maximal rates of glucose disposal measured by hyperinsulinemic euglycemic clamp (1800 pmol.m-2.min-1) improved from 1418 ± 156 to 1657 ± 128 𝝁mol.m-2.min-1 (P < 0.05)." In other words, hepatic insulin sensitivity was, if anything, improved (16% more insulin ⇒ 44% reduced glucose output). Meanwhile, peripheral insulin sensitivity seems constant as mean insulin dose was commensurate with glucose disposal (16% more insulin ⇒ 17% increase in glucose disposal). If you are a fan of low carbohydrate nutrition for any reason, realize that the only way it will ever be incorporated as an option in mainstream medicine is if a solid scientific case can be made. I believe there is merit to carbohydrate restriction as a therapeutic intervention. Having people like Dr. Jason Fung on "your side" is not a plus in this game. Having proponents like Dr. Tim Noakes, his foundation and a fad diet book author who somehow managed a PhD in Zoe Harcombe put out a book like Diabetes Unpacked, containing frank disinformation from Fung is unconscionable. The misinformation in Fung's chapter in this book is not an isolated incident. There's more to discuss from the chapter alone, his other books, podcasts and videos. Here's the end of his chapter, essentially portraying T2 diabetes as an accumulation of excess sugar in the body -- a statement we *KNOW* to be factually incorrect. If we understand that T2DM is simply too much sugar, then the solution becomes pretty bloody obvious. Get rid of it. Don’t hide it away. Get rid of it. There are really only two ways to get rid of the excessive sugar in the body. The first step is to eliminate all sugar and refined starches from your diet. Sugar has no nutritional value and can be safely eliminated. Starches are simply long chains of sugars. Highly refined starches such as flour or white rice are quickly digested into glucose. The optimum strategy is to eat little or no refined carbohydrates. Dietary protein is digested into amino acids. Excess amino acids cannot be stored so they are converted into glucose by the liver. Therefore, avoid eating excessive protein as this, too only adds sugar to the body. Protein shakes, protein bars, and protein powders should all be avoided. Instead focus on eating lots of vegetables and natural healthy fats. A moderate intake of protein is optimal. Dietary fat, long shunned for its purported effect of causing heart disease, is back. Natural fats, such as found in avocado, nuts and olive oil are well known to have healthy effects on both heart disease and diabetes. The Mediterranean diet, high in natural fats is well accepted to be a healthy diet. Dietary cholesterol has also been shown to have no harmful effect on the human body. Eggs and butter are excellent sources of natural fats, which have minimal effect on blood glucose or insulin. Most importantly, stick to eating whole, natural, unprocessed foods. Low refined carbohydrates, moderate protein and high natural fats. Fasting is the simplest and surest method to force your body to burn sugar. Blood glucose is the most easily accessible source of energy. Fasting is merely the flip side of eating – if you are not eating, you are fasting. When you eat, your body stores food energy. When you fast, your body burns food energy. If you simply lengthen out your periods of fasting, you can burn off the stored sugar. T2DM is merely excessive glucose in the body, so burning it off will reverse the disease. While it may sound severe, fasting has been practiced for at least 2000 years. It is the oldest dietary therapy known. Literally millions of people throughout human history have fasted without problems. If you are taking prescription medications, you should seek the advice of a physician. But the bottom line comes to this. Giving this man a podium is a huge problem that I can see.